Source: Received for an honest from the author. 99 cents at present, Free to Kindle Unlimited Subscribers! 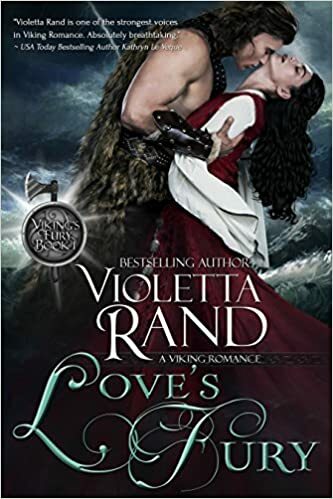 LOVE’S FURY by Violetta Rand is a brilliantly written Medieval Viking Romance. # 1 in her new and highly anticipated “Viking’s Fury” series. WOW! Absolutely, captivating! Ms. Rand’s Viking stories are truly amazingly bold, passionate, and emotional. Meet, Konal the Red, the younger brother of a Danish Prince sent to invade Northumbria. And Silvia, the only child of the church undersecretary. After her village is attacked, and her beloved father was killed during the seige, she vows revenge. She becomes part of Konal’s spoils of war. While, Silvia, is bent on revenge, an eye for an eye, from the barbaric invaders, Konal is bent on possessing her body and heart. Sparks fly. Passion deepens. Love blossoms. But can love survive or will they both lose, in this battle of lust, passion and love? Fast paced, quick read, written with vivid imagery, that the reader can feel the hatred and contempt, the turmoil between the characters, their struggles between duty, lust, finding and holding on to their blossoming love, with respect and devotion. To me, “Love’s Fury” is a powerful, compelling, emotionally charged story, one the reader will not be able to put down. Ms. Rand writes a masterful , passionate tale of Viking ancestry, that compels as well as entertains the reader. The characters are bold, engaging, full of energy with more than just lust, power, and dominaning the Saxon people. Once again, Ms. Rand has written a superb Viking tale! A must read! Magnificent! I can’t wait for the next installment. Fans of Medieval Romance, Historical Romance, lusty Vikings and feisty ladies, really should give Ms. Rand’s “Love’s Fury” a try. you will not regret your choice.